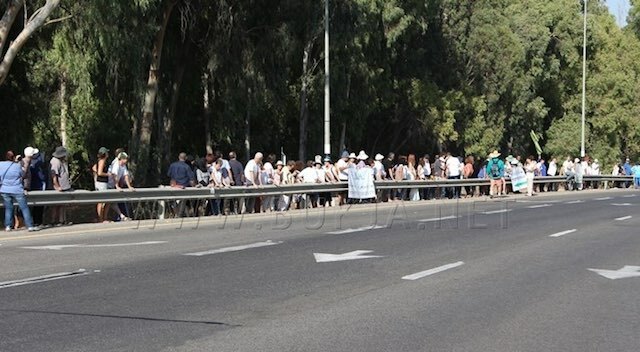 Nearly 1000 Jewish and Arab residents joined seven mayors from different municipalities to form a human chain north of Israel, calling for coexistence and condemning violence. They lined up along the road in the Wadi Ara region to call for calm, understanding, and cooperation in creating a shared society for all citizens. Givat Haviva, a non-profit group founded in 1949 by the Kibbutz Federation, organized the Friday afternoon event, and afterward, hosted dialogue and sharing circles under a big tent. You can see photos on their Facebook Page. RELATED: Bereaved Palestinian, Israeli Parents Unveil Something Beautiful at U.N.
1. Israel’s Declaration of Independence affirms that the State of Israel is based on the principle of equality, and has been a shared home for both Jews and Arabs since its inception. 2. We call upon all the citizens of Israel, and residents in Wadi Ara and the Triangle in particular, to maintain an attitude of respect and avoid any harm to one another. We vehemently condemn any attack on body, soul, or property, as well as any expression of physical or verbal abuse. 3. We appeal to the leaders of both peoples to refrain from incitement and the ferment of emotions. Our task at this time is to inspire calm and ensure public safety. We appeal to religious leaders, intellectuals, educators and teachers to lead us in a dialogue that will help adults and children to deal with the complex situation in a way that will not lead to manifestations of racism, revenge, injury, or threats to the other. 4. We recognize the reality that the State of Israel’s near 50-year occupation of the West Bank has deeply affected us on a daily basis, causing tension, violence and danger to the existence of a democratic society in Israel. We urge the Israeli government to pursue a political solution that will enable all people in Israel to live in security and peace. 5. We recognize the great sensitivity of the Temple Mount / Al Aqsa Mosque for both Jews and Muslims. We ask the Israeli government, the government of Jordan and the Palestinian Authority to manage the crisis responsibly and to return to the preservation of the status quo on the Mount. In recent years we joined Givat Haviva’s “Partnership between Communities” program, through which we seek to live as good neighbors and establish healthy, constructive relationships which can bestow security and social and economic advancement to all the region’s residents, Jewish and Arab. Today, with the deterioration in security and in relations between Jews and Arabs, we want to preserve the fabric of life together that we have put great effort into building. During this time of crisis, we will continue to maintain good relations and promise to remain faithful and committed to our partnership, which is based on mutual responsibility and equality between Jews and Arabs in the region and in the country.